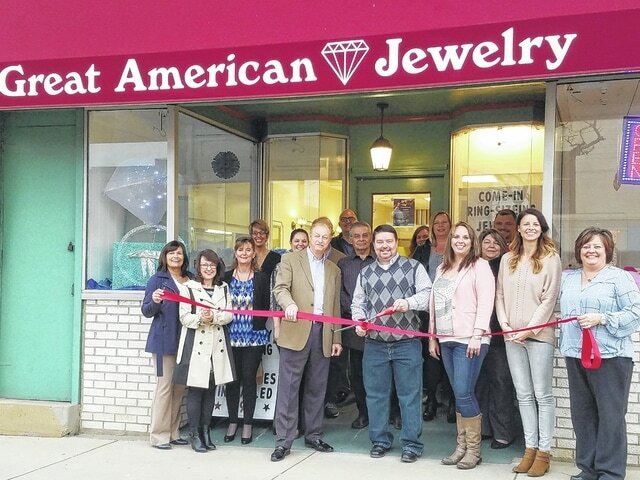 Members of the Chamber Ambassador team and representatives from the City of Washington gather around the Great American Jewelry staff while owner Shane Johnson (center) cuts the ribbon with staff members Steve Shiltz (left) and Misti Roese (right). The Boylan Jewelry Store is no longer in business, but the tradition continues at 112 W. Court St., site of the former jewelry store, with Great American Jewelry. The Fayette County Chamber of Commerce recently welcomed the store with a ribbon cutting. Owner Shane Johnson and fiancé Mistie Roese are proud to bring their full-service jewelry store to Washington Court House. “We do repairs – most jobs are finished within a day or two- as well as custom designed jewelry, replace watch batteries and buy gold and silver,” explained Roese. The store is also a Citizen watch retailer. https://www.recordherald.com/wp-content/uploads/sites/27/2017/02/web1_2.22.17-Great-Amer-Jewelry.jpgMembers of the Chamber Ambassador team and representatives from the City of Washington gather around the Great American Jewelry staff while owner Shane Johnson (center) cuts the ribbon with staff members Steve Shiltz (left) and Misti Roese (right).